Fire up the grill and enjoy one of these great tasting sandwiches. Bigelow Pomegranate Pizzazz has given this tofu sandwich the additional flavor you'll love. 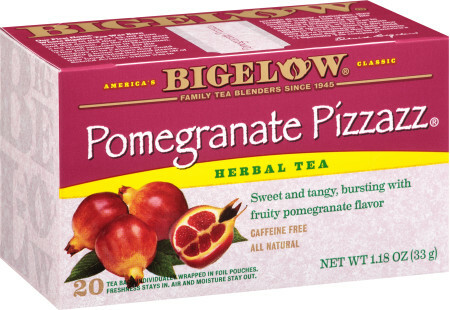 Place Bigelow® Pomegranate Pizzazz Herbal tea bags in a measuring cup and add boiling water. Let steep for 5 minutes. Remove tea bags and reserve ½ cup (125mL) tea. Place tofu into a large dish, pour tea over and marinate for ½ hour, turning once or twice. Preheat grill and grill tofu turning once after five minutes, cooking both sides for five minutes. Prepare sandwiches by tossing greens with vinaigrette. Spread 4 slices of bread with mayonnaise and/or mustard, 2 slices of tofu, ¼ of the greens, ¼ of the red pepper and a slice of cheese, cover with another slice of bread. Continue until you have 4 sandwiches.